Composed by Traditional. Arranged by Jerry Brubaker. 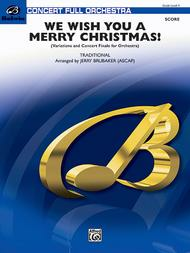 Full Orchestra; Performance Music Ensemble; Single Titles. Belwin Concert Full Orchestra. Christmas; Secular; Winter. Score. 24 pages. Duration 4:00. Belwin Music #00-29688S. Published by Belwin Music (AP.29688S). At last! Here's that ultimate finale for your holiday concert that you've been waiting for! Here are new variations on the ever-familiar We Wish You A Merry Christmas that will knock your socks off! It is a journey through many musical styles with a conclusion as exciting as any Sousa march. Add an optional synthesizer for added pizzazz! (4:00).